EY460 was looking like it was going to be an on time departure, as you can see I had almost 3 hours to spare before the flight, so I could enjoy the ground facilities. I crossed the road from the hotel towards the T3 premium entrance which is clearly signposted! I made my way to the first class check-in 'lounge'. I took a seat whilst the porters tagged my bags and the check-in agent took my passport and issued my boarding pass. Next it was straight through priority passport control and security and then onwards into the terminal. I made my way into the lounge. Business and First Class share the same entrance but once you get inside they are separated. Since I had not eaten anything since lunch, it was time for dinner. I took a seat in the restaurant area and was immediately presented with a menu, offered a cold towel and a glass of champagne. Eventually I decided to head to the gate. I didn't want to miss any of my time on board so wanted to make sure I was there when boarding was called. Boarding was announced for first class passengers so away I went. Unfortunately it seems they called it a little early as I was stopped at the top of the jetway and had to wait a couple more minutes. Soon enough though I was heading down to the aircraft. I noticed the registration was A6-ETM. This aircraft was just 18 months old at the time of this flight. First impressions were great. The suite has almost complete privacy with a sliding door and fairly high walls. 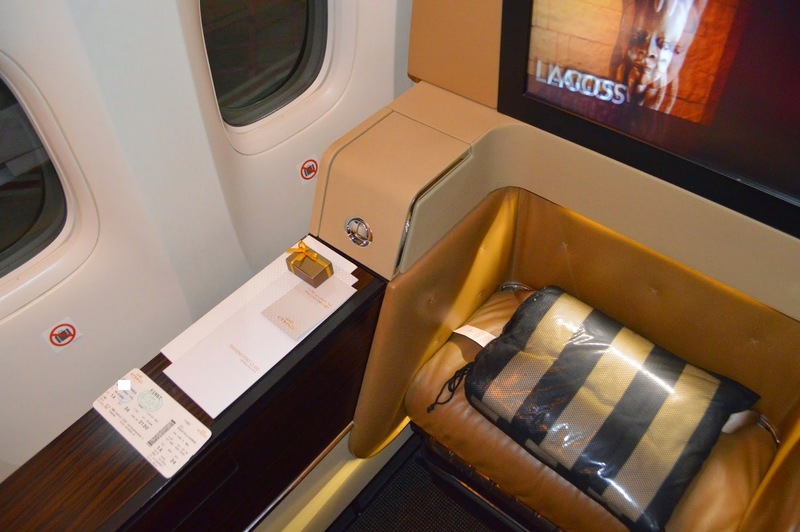 The design of it was very classy in my opinion, more so than the 'faux wood' look of Emirates. There is quite a lot of room in the suite, as you can see my roll-a-board Samsonite cabin case fits nicely below the ottoman. The lack of overhead luggage bins creates a nice open feeling. Menus, a chocolate, a plush blanket and noise cancelling headsets had already been placed ready for my arrival. Moments later a refreshing towel was provided. It wasn't long before I was sipping on a large flute of Champagne. The offering on this flight was Champagne Billecart-Salmon "Cuvee Nicolas Francois Billecart" Brut 1999. You can find this in your local 'Dan Murphy's' store for about $190.00 (AUD) per bottle. It was great, and I managed to finish quite a number of glasses during the flight. It wasn't long before the doors were closed and we were on our way. I was looking forward to getting out of the 43 degree heat in Abu Dhabi and into the Melbourne winter. The Etihad inflight entertainment system is called 'E-Box'. The system was quite fast and responsive and the screen was of a good quality. There was a good selection of movies, although not quite as many as Emirates 'ICE' system. Etihad offers a chef on board who prepares/plates the meals. I think it's really just a bit of a show as they don't really cook anything other than maybe some eggs. However, the chef on board this flight was very friendly and happy to assist with suggestions. All the food was quite tasty, but not spectacular. Certainly not as nice as my Qatar Airways flight in business on the B787 a couple of days earlier (read that review here). The presentation was quite good although the dessert came in an aluminium foil container. The chef explained he was having trouble with the oven and couldnt get it out of the container properly to plate it, so he decided to leave it in the container. Apparently it was something to do with the fact that he had to microwave it rather than bake it in the oven? Or something along those lines. He seemed very apologetic about the presentation, anyway it tasted pretty nice. The chardonnay I had was great too. After dessert it was time for a nice cup of Dilmah tea. There was so many to choose from! I decided to try the Arabian Mint Tea with Honey and it was delicious. With the meal service over it was time to get changed into the Etihad pyjamas. There is quite a large lavatory/changing room to use for getting changed. The seat reclines into a fully flat bed. The crew put a mattress over it and some lovely crisp sheets. The amenity kit even includes some spray to spray onto your pillow to give it a nice smell to help you relax and get a good nights sleep. All in all, I found it super comfortable, and once the doors were closed I felt like I had my own little hotel room on board. I went to sleep fairly soon after, but even in the most comfortable bed I always have broken sleep on aircraft. After waking up a few times in some turbulence over the indian ocean I decided to get up and order a snack. You can order food whenever you want from the 'Kitchen Anytime' menu. I do find I miss Pork when flying through the middle east, the substitute meats aren't quite as nice as a nice piece of bacon! Still, the eggs were very nice and freshly made to order. The crew handed out express cards for use in Melbourne, although I didn't need it as I used smartgate and there was no queues at all. I was through immigration and customs pretty quickly and my bags weren't far behind either. My chaffeur was waiting for me in the arrivals hall and I was whisked away home. 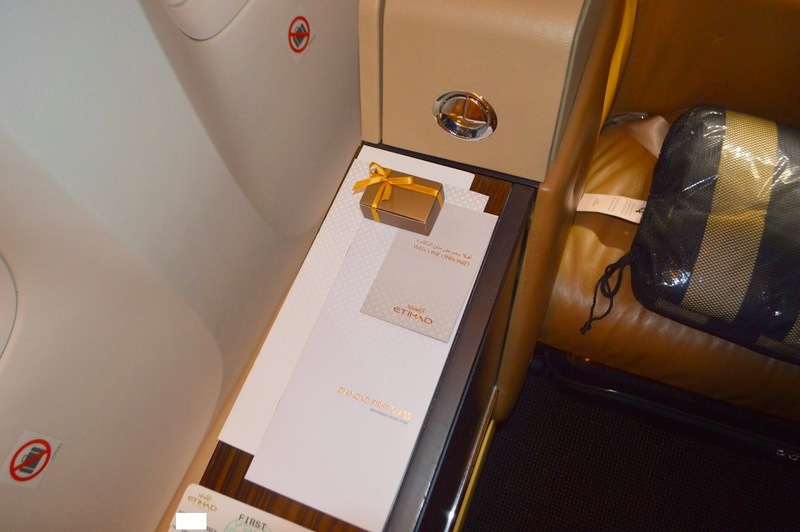 All part of the included service on Etihad in First Class. Overall a pretty good flight. My interactions with the crew were all quite good, I felt very looked after but I don't feel they were as polished or friendly as those on Qatar business class. The food was decent but not as nice as Qatar business class, or Emirates First. So I think they have a few things to improve upon. The seat / suite itself was superb, one of the best I've flown in. I love the privacy, the design and the whole feel of the first class cabin. I didn't like being served breakfast at 3.30pm local time in Melbourne, so if I was to do the flight again I would pre-order a normal dinner meal to be served before landing, instead of breakfast. This is entirely possible as you can order whatever you want, whenever you want. I hope to try the reverse flight Melbourne to Abu Dhabi next time, and I will compare the catering standards from my home port. Thanks for reading!